The hugely expensive household survey detects only about 6% of heroin users. The much cheaper ADAM program detects the other 94%. Guess which one just got cancelled? The hugely expensive household survey detects only about 6% of heroin users. For about a fifth as much money, the ADAM program (interviewing and drug-testing a sample of arrestees) detects the other 94%. Guess which program the federal government just cancelled (again)? Beau Kilmer and Jon Caulkins explain why this is folly bordering on madness. House Republicans want to give states the authority to drug-test food stamp applicants. 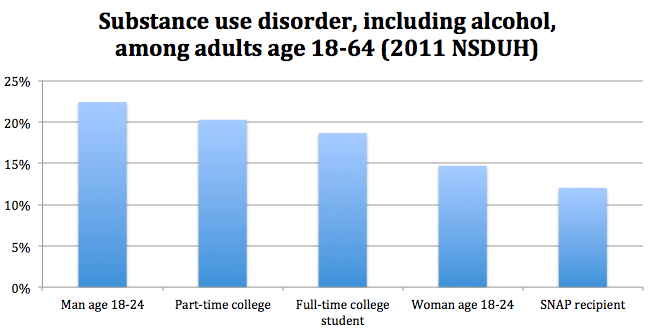 Yet as Sheldon Danziger and I discuss in Wonkblog today, young adults show much higher rates of drug and alcohol disorders than do SNAP recipients.